Comments: William Day Smith married Annie Parker 'Parke' Harris on June 3, 1910, in Scottsville. William was principal of Scottsville High School, and Parke taught school there. 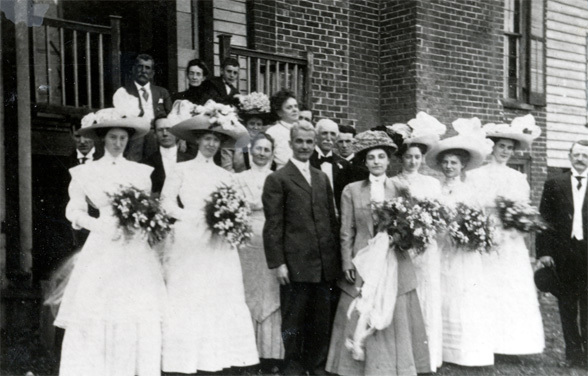 William and Parke are shown with their wedding party at Fairview (now High Meadows). 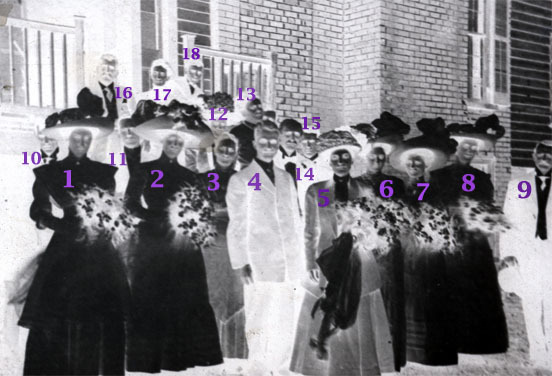 Use the image below as a guide to the names of the Smith wedding party. (1) Helen Harris (1892-1983), daughter of Charles Bascom Harris, Sr., and Helen Goddin (Crafton) Harris. Helen was the sister of Annie Parker (Harris) Smith. (3) Helen Goddin (Crafton) Harris (1856-1954), mother of the bride, Annie Parker (Harris) Smith, and wife of Charles Bascom Harris, Sr.
(4) William Day Smith, the groom. William was the principal of Scottsville High School for thirty years (1907-1937). The William Day Smiths lived on Valley Street in the house that is now Thacker Brothers Funeral Home. (5) Annie Parker 'Parke' (Harris) Smith (1880-1953), the bride. Parke attended Peabody College in Nashville, Tennessee, and taught in Georgia before returning to teach in Scottsville schools. There she met William Day Smith, her future husband. William and Parke Smith became the parents of two children: Frances Crafton Smith and Charles William Smith. (6) Marjorie Harris (1889-1983), daughter of Charles Bascom Harris, Sr., and Helen Goddin (Crafton) Harris. Marjorie was the sister of Annie Parker (Harris) Smith. (7) Mary Browne was the daughter of Reverend Browne, minister of the Scottsville Methodist Church. Mary later married Thomas Ellison Bruce. (8) Alexina Harrison was a good friend of the Harris family and the daughter of Casseus and Betty E. Harrison. Two years later, Alexina married Charles Bascom Harris, Jr., brother of Annie Parker (Harris) Smith. (9) Dr. Joseph P. Blair, a dentist and member of the Scottsville Town Council. (10) Charles Bascom Harris, Jr. (1883-1959), son of Charles Bascom Harris, Sr., and Helen Goddin (Crafton) Harris. Charles was the brother of Annie Parker (Harris) Smith. (13) Sallie Cabell Parker, cousin of Helen Goddin (Crafton) Harris. (14) Charles Bascom Harris, Sr. (1851-1930), father of Annie Parker (Harris) Smith. Charles was co-owner and operator of 'Harris Merchandise', a general merchandise store on Main Street in Scottsville. (16) Henry Hartwell Gary Harris (1847-1916), uncle of Annie Parker (Harris) Smith. A Confederate veteran, Henry worked for his father, Miletus, after the Civil War at 'Harris Merchandise' on Scottsville's Main Street. Later Henry co-owned this store with his brother, Charles. (18) Henry Miletus Harris (1896-1984), son of Charles Bascom Harris, Sr., and Helen Goddin (Crafton) Harris. Henry was the brother of Annie Parker (Harris) Smith. These two photos are part of the Katherine Ellis collection. Katherine resides in Scottsville and is the granddaughter of Charles Bascom Harris, Sr., and Helen Goddin (Crafton) Harris.